The Tenth Amendment (Amendment X) to the United States Constitution, which is part of the Bill of Rights, was ratified on December 15, 1791. It expresses the principle of federalism and states' rights, which strictly supports the entire plan of the original Constitution for the United States of America, by stating that the federal government possesses only those powers delegated to it by the United States Constitution. All remaining powers are reserved for the states or the people. The amendment was proposed by the 1st United States Congress in 1789 during its first term following the adoption of the Constitution. It was considered by many members as a prerequisite to many state ratifications of the Constitution and particularly to satisfy demands of Anti-Federalists who opposed the creation of a stronger federal government. After the Constitution was ratified, South Carolina Representative Thomas Tudor Tucker and Massachusetts Representative Elbridge Gerry separately proposed similar amendments limiting the federal government to powers "expressly" delegated, which would have denied implied powers. James Madison opposed the amendments, stating that "it was impossible to confine a Government to the exercise of express powers; there must necessarily be admitted powers by implication, unless the Constitution descended to recount every minutia." When a vote on this version of the amendment with "expressly delegated" was defeated, Connecticut Representative Roger Sherman drafted the Tenth Amendment in its ratified form, omitting "expressly." Sherman's language allowed for an expansive reading of the powers implied by the Necessary and Proper Clause. The Tenth Amendment, which makes explicit the idea that the federal government is limited to only the powers granted in the Constitution, has been declared to be a truism by the Supreme Court. In United States v. Sprague (1931) the Supreme Court asserted that the amendment "added nothing to the [Constitution] as originally ratified." In Garcia v. San Antonio Metropolitan Transit Authority (1985), the Court overruled National League of Cities v. Usery (1976). Under National League of Cities, the determination of whether there was state immunity from federal regulation turned on whether the state activity was "traditional" for or "integral" to the state government. In Garcia, the Court noted that this analysis was "unsound in principle and unworkable in practice", and concluded that the framers believed that state sovereignty could be maintained by the political system established by the Constitution. Noting that the same Congress that extended the FLSA to cover government-run mass transit systems also provided substantial funding for those systems, the Court concluded that the structure created by the framers had indeed protected the states from overreaching by the federal government. In South Carolina v. Baker (1988), the Court said in dicta that an exception to Garcia would be when a state lacked "any right to participate" in the federal political process or was left "politically isolated and powerless" by a federal law. Since 1992, the Supreme Court has declared laws unconstitutional for violating the Tenth Amendment when the federal government compelled the states to enforce federal statutes. In New York v. United States (1992), the Supreme Court invalidated a portion of a federal law for violating the Tenth Amendment. The case challenged a portion of the Low-Level Radioactive Waste Policy Amendments Act of 1985. The act provided three incentives for states to comply with statutory obligations to provide for the disposal of low-level radioactive waste. The first two incentives were monetary. The third, which was challenged in the case, obliged states to take title to any waste within their borders that was not disposed of prior to January 1, 1996, and made each state liable for all damages directly related to the waste. The Court ruled that the imposition of that obligation on the states violated the Tenth Amendment. Justice Sandra Day O'Connor wrote that the federal government can encourage the states to adopt certain regulations through the spending power (e.g. by attaching conditions to the receipt of federal funds, see South Dakota v. Dole,) or through the commerce power (by directly pre-empting state law). However, Congress cannot directly compel states to enforce federal regulations. In Printz v. United States (1997), the Court ruled that part of the Brady Handgun Violence Prevention Act violated the Tenth Amendment. The act required state and local law enforcement officials to conduct background checks on people attempting to purchase handguns. Justice Antonin Scalia, writing for the majority, applied New York v. United States to show that the act violated the Tenth Amendment. Since the act "forced participation of the State's executive in the actual administration of a federal program", it was unconstitutional. In Murphy v. National Collegiate Athletic Association (2018), the Supreme Court ruled that the Professional and Amateur Sports Protection Act of 1992, which prohibited states that banned sports betting when the law was enacted from legalizing it, violated the anti-commandeering doctrine and invalidated the entire law. The Court ruled that the anti-commandeering doctrine applied to congressional attempts to prevent the states from taking a certain action as much as it applied in New York and Printz to Congress requiring states to enforce federal law. In the 20th century, the Commerce Clause has become one of the most frequently-used sources of Congress's power, and thus its interpretation is very important in determining the allowable scope of federal government. Complex economic challenges arising from the Great Depression triggered a reevaluation in both Congress and the Supreme Court of the use of Commerce Clause powers to maintain a strong national economy. In Wickard v. Filburn (1942), in the context of World War II, the Court ruled that federal regulations of wheat production could constitutionally be applied to wheat grown for "home consumption" on a farm – that is, wheat grown to be fed to farm animals or otherwise consumed on the farm. The rationale was that a farmer's growing "his own wheat" can have a substantial cumulative effect on interstate commerce, because if all farmers were to exceed their production quotas, a significant amount of wheat would either not be sold on the market or would be bought from other producers. Hence, in the aggregate, if farmers were allowed to consume their own wheat, it would affect the interstate market in wheat. In United States v. Lopez (1995), a federal law mandating a "gun-free zone" on and around public school campuses was struck down because, the Supreme Court ruled, there was no clause in the Constitution authorizing it. This was the first modern Supreme Court opinion to limit the government's power under the Commerce Clause. The opinion did not mention the Tenth Amendment or the Court's 1985 Garcia decision. Most recently, in Gonzales v. Raich (2005), a California woman sued the Drug Enforcement Administration after her medical cannabis crop was seized and destroyed by federal agents. Medical cannabis was explicitly made legal under California state law by Proposition 215, despite cannabis being prohibited at the federal level by the Controlled Substances Act. Even though the woman grew cannabis strictly for her own consumption and never sold any, the Supreme Court stated that growing one's own cannabis affects the interstate market of cannabis. The theory was that the cannabis could enter the stream of interstate commerce, even if it clearly wasn't grown for that purpose and that was unlikely ever to happen (the same reasoning as in Wickard v. Filburn). It therefore ruled that this practice may be regulated by the federal government under the authority of the Commerce Clause. In Cooper v. Aaron (1958), the Supreme Court dealt with states' rights and the Tenth Amendment. The case came about when conflicts arose in direct response to the ruling of another landmark case, Brown v. Board of Education (1954). In Brown, the Supreme Court unanimously declared racial segregation of children in public schools unconstitutional. Following Brown, the court ordered district courts and school boards to proceed with desegregation “with all deliberate speed." In other words, the Court's decision not only ruled segregation as an unconstitutional and illegal practice, but also prompted all public schools to open its doors to black students and provide access to facilities to white and black students equally. This ruling quickly spurred upsetting conflicts between those trying to enforce the ruling and those refusing to abide by it. The federal system limits the ability of the federal government to use state governments as an instrument of the national government, as held in Printz v. United States. For this reason, Congress often seeks to exercise its powers by encouraging States to implement national programs consistent with national minimum standards; a system known as cooperative federalism. One example of the exercise of this device was to condition allocation of federal funding where certain state laws do not conform to federal guidelines. For example, federal educational funds may not be accepted without implementation of special education programs in compliance with IDEA. Similarly, the nationwide state 55 mph (90 km/h) speed limit, 0.08 legal blood alcohol limit, and the nationwide state 21-year drinking age were imposed through this method; the states would lose highway funding if they refused to pass such laws (though the national speed limit has since been repealed). In National Federation of Independent Business v. Sebelius (2012), the Court ruled that the Patient Protection and Affordable Care Act (commonly referred to as the ACA or Obamacare) unconstitutionally coerced the states to expand Medicaid. The Court classified the ACA's language as coercive because it effectively forced States to join the federal program by conditioning the continued provision of Medicaid funds on states agreeing to materially alter Medicaid eligibility to include all individuals who fell below 133% of the poverty line. ^ "The Bill of Rights: A Transcription". United States National Archives and Records Administration. Retrieved September 20, 2010. ^ Cooper, Charles. "Essay on the Tenth Amendment:Reserved Powers of the States". Retrieved September 11, 2014. ^ Justice Robert F. Utter (July 18, 2010). ""Freedom and Diversity in a Federal System: Perspectives on State Constitutions and the Washington Declaration of Rights" by Justice Robert F. Utter". Digitalcommons.law.seattleu.edu. Retrieved October 29, 2015. ^ "Articles of Confederation from Yale University". Yale Law School Avalon Project. Archived from the original on December 5, 2008. Retrieved December 16, 2008. ^ a b "House of Representatives, Amendments to the Constitution". University of Chicago. Retrieved December 16, 2007. ^ Epps, Garrett. "Constitutional Myth #7: The 10th Amendment Protects 'States' Rights'". The Atlantic. Retrieved June 26, 2013. 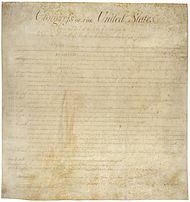 ^ "Bill of Rights Documents: Document 11: House of Representatives, Amendments to the Constitution". The Founders' Constitution. University of Chicago. June 8; July 21; August 13, 18-19, 1789. Retrieved June 19, 2015. ^ Gibson v. Matthews, 926 F.2d 532, 537 (6th Cir. 1991): "The ninth amendment was added to the Bill of Rights to ensure that the maxim expressio unius est exclusio alterius would not be used at a later time...."
^ Calabresi, Steven; Prakash, Saikrishna (1994). "The President's Power to Execute the Laws". Yale Law Journal. 104. The message of the Tenth Amendment is that expressio unius est exclusio alterius applies to lists of governmental powers. ^ Rollins, Henry Lawrence. "Henry Speaks On His Consciousness-Expanding Trip to the Library of Congress With Ian MacKaye". Retrieved November 16, 2011. ^ United States v. Sprague, 282 U.S. 716, 733-34 (1931). ^ United States v. Darby Lumber Co., 312 U.S. 100, 124 (1941). ^ Garcia v. San Antonio Metropolitan Transit Authority, 469 U.S. 528 (1985). ^ "Federalism and Intergovernmental Tax Immunity Now Rest In Peace: South Carolina v. Baker". 1988. Retrieved May 25, 2018. ^ New York v. United States, 505 U.S. 144 (1992). ^ a b South Dakota v. Dole, 483 U.S. 203 (1987). ^ a b c Printz v. United States, 521 U.S. 898 (1997). ^ "Opinion analysis: Justices strike down federal sports gambling law (Updated)". SCOTUSblog. May 14, 2018. Retrieved May 15, 2018. ^ Wickard v. Filburn, 317 U.S. 111 (1942). ^ a b c "Brown v. Board of Education". A&E Networks. 2009. Retrieved May 25, 2018. ^ "Little Rock Nine". History. Retrieved May 25, 2018. ^ a b c Farber, Daniel (1982). "The Supreme Court and the Rule of Law: Cooper v. Aaron Revisited". University of Illinois Law Review. 1982: 387–412 – via HeinOnline. ^ a b Bhagwat, Ashutosh (2008). "Cooper v. Aaron and the Faces of Federalism" (PDF). Saint Louis University Law Journal. 52: 1087–1113 – via HeinOnline. ^ National Federation of Independent Business v. Sebelius, 567 U.S. 519 (2012). Tenth Amendment Center – works to preserve and protect Tenth Amendment freedoms through information and education.